No, I mean people that just throw money away when it comes to picking out a decent cigar. There are two ways to blow money when it comes to buying cigars. 2. Buy cigars that are too cheap. Frankly, I am not sure which is the greater sin, so let’s start with the first one. Twenty years ago, things were different. Your cigar choices were limited in two ways. One, there were just a lot less cigars out there and two, you were pretty much victim to whatever your local cigar shop deemed appropriate to carry. There are lots of cigar companies out there…big and small. The big boys like Avo are putting out quality cigars at a variety of price points. New start-ups like NomadCigarCompany.com have figured out how to create quality cigars and an amazing price. So, at the end of the day, you don’t need to pay $20 a stick for a quality cigar. Heck, you don’t even have to pay $15. Secondly, stop chasing cigar that are under $4.00 a stick. I mean really. What kind of quality do you really think you are getting? For the most part (and yes, there are a couple of exceptions but probably not yours) anything under $4.00 a stick is the bologna of the cigar world – you just don’t know what you are getting. My advice to the first group is try some lesser expensive cigars. Stop trying to prove yourself to the world via showing off the right “label” and actually enjoy a better smoke. As for the second group. 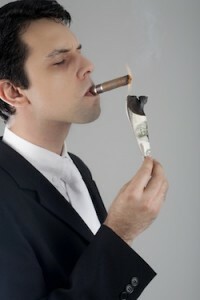 If it is a budget issue, just skip a cigar here and there and double your budget. You will have a much better cigar experience and stop blowing money on crappy sticks.